NEO YOKIO truly is an anomaly. When the first season came out, no one knew what to make of it. NEO YOKIO is an American produced anime, starring Will Smith’s son, Jaden. On the surface, it seems like some sort of vanity project, and it’s “bad” in a way that feels like satire, but leaves the viewer questioning what the true intention of it was. It also feels like a giant advertisement for Toblerone chocolate and fashion brands. Jaden’s character Kaz Kaan is the most eligible bachelor in Neo Yokio, but he is also a demon slayer, and also fashion connoisseur. He saves an old friend who was a top fashion blogger, but became “woke” and went full hikikomori (essentially a recluse) to escape the meaningless material world around her. The show kind of forgets that Kaz Kaan is a demon slayer for a while, while focusing on what a pretentious self absorbed character he is, whilst parodying anime like Ranma ½ and taking on issues like how to treat women and people in general. All of this was packed into just 6 slow to digest episodes. I can’t say I’m a huge fan of the show as much as I am fascinated with it, but with a second viewing of the first season, I think I’m starting to get a feel for its somewhat dry humor. 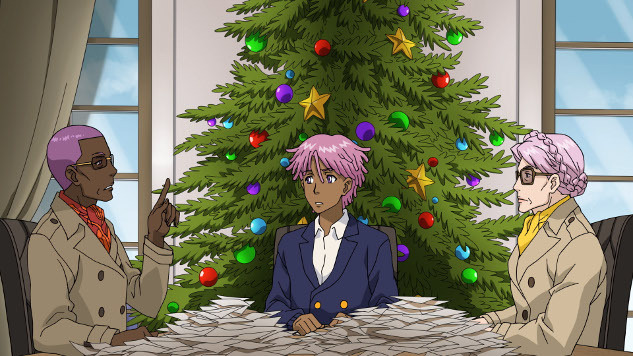 Though if you look at the page for NEO YOKIO on Netflix right now, it says that Season 2 is coming December 7th, which may be referring to the upcoming special NEO YOKIO: PINK CHRISTMAS. It appears in this trailer that they are attempting to push the show further in substance, and I’m interested. Would love to hear what you Talkbackers think of the show!